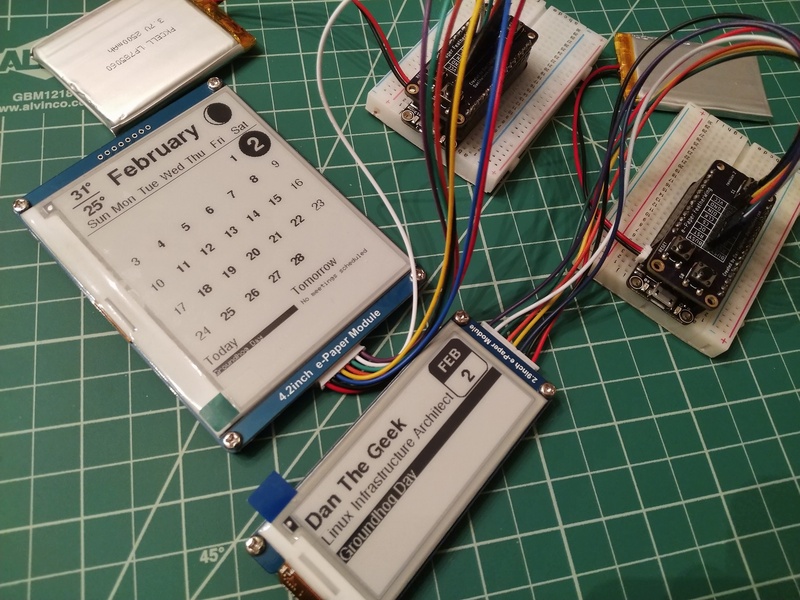 This is the third in a series of articles about using microcontroller devices with e-paper displays for displaying dynamic calendars. 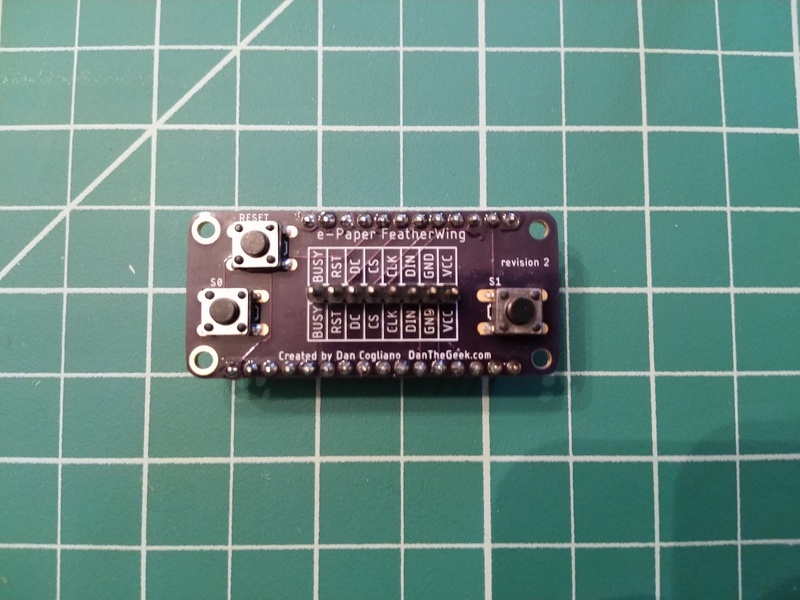 The custom Featherwing described in this article is available for purchase on Tindie. Prior to creating the custom Featherwing, I plugged the e-paper display wires into the HUZZAH directly with the cable provided with the Waveshare display. This method can be used instead of the custom Featherwing but does not allow for the extra buttons, but it is a good method for testing. Since the supplied cable uses female connectors, you may need male jumper wires to connect to the female headers like I did. The Waveshare e-paper display library will need to be updated for these pins. You can find the pin definitions in the epdif.h file in the library. Due to fewer GPIO pins available for use on the 8266, I had to make a compromise with the buttons. Button S1 required mapping its pin to a pin used for the I2C interface. This is really not a problem for the e-paper display since it is using an SPI interface, but if there are other Featherwings installed that are using an I2C interface, you may wish to leave out the S1 button ( or avoid pressing it!). The other buttons worked without issue. Here is a layout of how the pins are used with the Featherwing. The Adafruit HUZZAHs are the only Feathers so far that have been tested. In keeping with the compatibility between the 8266 and 32 boards, I also made LED pin definitions that would work with both boards. Since the 8266 uses the pin in reverse from the 32, LEDPINON and LEDPINOFF defines were added to make the code work with either board. The schematics availability in the parts library was a big time saver, which saved me from entering the dimensions of the Featherwing and all the hole placements from scratch. After watching a few videos to learn how to use Eagle, I moved from importing the components from the parts library and connecting wires in the schematic to switching to the PCB board view and routing wires. I then added the silk screening to label the pins, buttons and other text. I duplicated the pin labeling on the bottom in case I wanted to wire the Featherwing below the HUZZAH instead of the top. 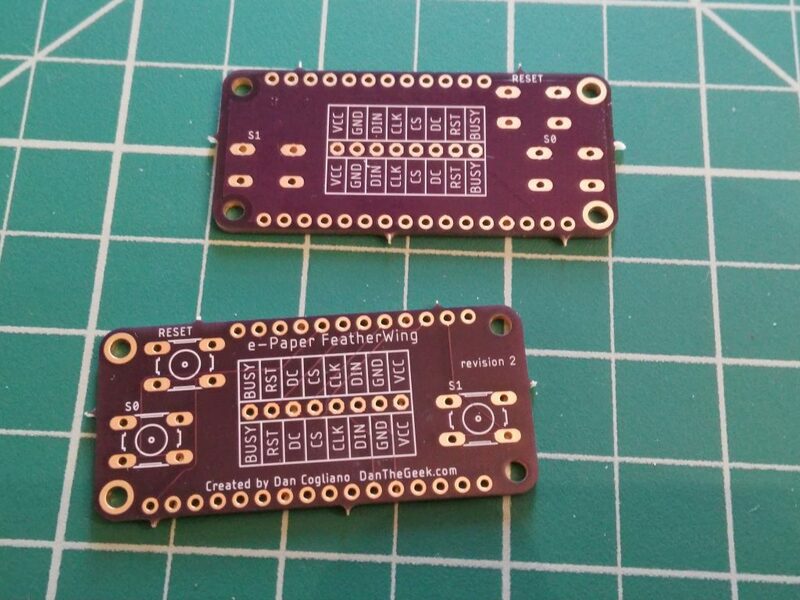 I then sent the design off to Oshpark.com for fabrication. Front (bottom of photo) and back (top of photo) of the e-paper Featherwing board. Putting it together requires just some male headers and optional buttons. You could also use female headers if you want to put the board below the main feather board. 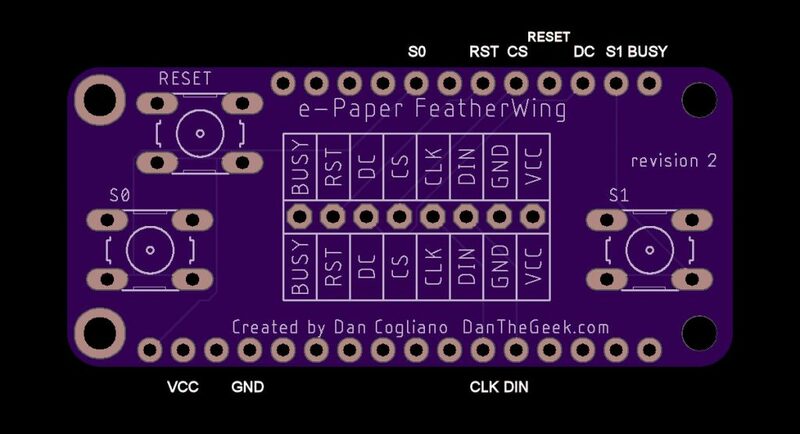 Adafruit has a great tutorial on how to solder headers onto a Feather. The e-paper interface is just 8 header pins pointing up, so you will need to solder it from the bottom. I would recommend soldering the 8 header pins before soldering the buttons, since the buttons can get in the way a bit if put the header pins in a breadboard to secure them for soldering. 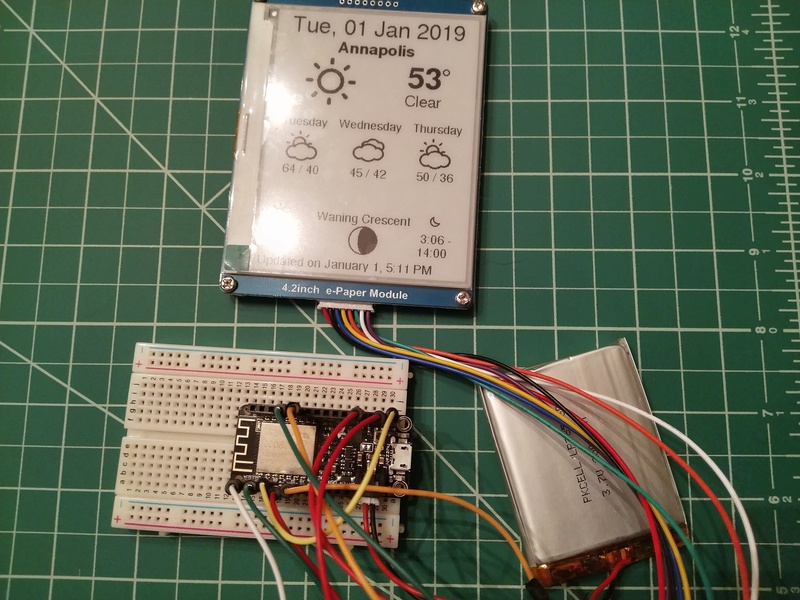 Pingback: Creating A Custom ePaper Display FeatherWing #Feather #FeatherWing #ePaper #Adafruit @Adafruit @cogliano « Adafruit Industries – Makers, hackers, artists, designers and engineers! Hi Dan, thanks for your article, are you thinking to publish the source code? that could be really useful. Yes, it will be published on GitHub in the next few weeks, have a few more things to add and test.